Motorcyclists in serious danger of 'Death by Pothole'. Motor Cycle News (MCN) has launched an anti-pothole campaign to highlight the very real danger that the UK’s motorcycling community are facing, because of the critical state of our roads. This week’s newspaper highlights the story of Simon Machin, 34, from Thame, Oxfordshire, who is lucky to be alive after crashing on a pothole in the fast lane of the M40 earlier this month. Thousands of bikers have already joined the campaign at www.motorcyclenews.com/potholes. MCN is asking readers to upload pictures of dangerous potholes with details of the location, and report it to the council via a link on its website. 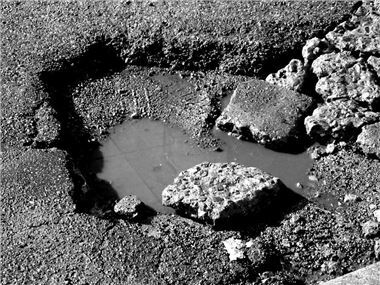 If the pothole is not repaired after two weeks, MCN will “name and shame” the relevant councils and if necessary have the holes professionally filled. The extraordinary thing is, as freelance writer Richard Yarrow recently pointed out, many UK journalists have recently been testing cars in regions that get far more serious snow and frosts than the UK ever does. The recent 600 kilometre drive of the BMW F10 5-Series through the Pyrenees is a case in point. We drove in temperatures from minus 6 to plus 25. Yet every single metre of these frequently snow covered roads was smooth and completely pothole-free. It seems that UK budgets that should have been spent on road maintenance have been stupidly diverted into creating speed humps, speed cushions and other obstacles on them, to the ridiculous extent that, due to the shocks created, we now even have potholes in speed humps. A metaphor, if any were needed, for the state of the country as a whole.